The stunned X-Men watch as Cyclops struggles to his feet, his psychic death at the hands of Mastermind having almost killing his physical body as well. Just then, Wolverine bursts into the room, still fighting a handful of guards. 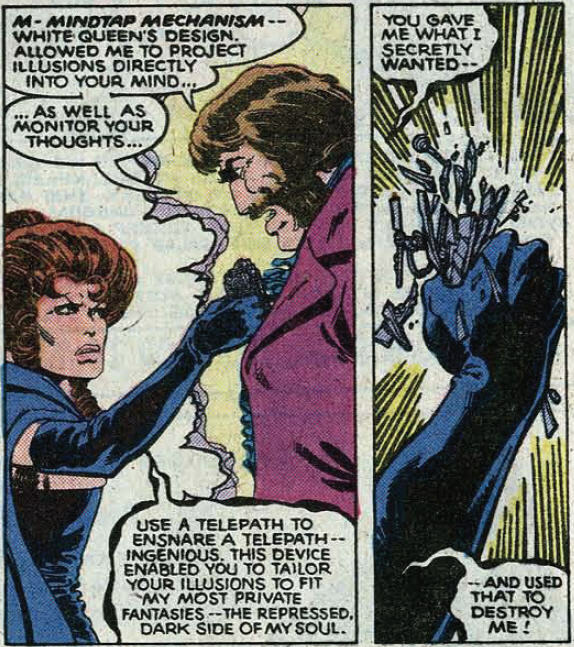 Mastermind orders the Black Queen to attack him, and she telekinetically tosses Wolverine across the room while also secretly unlocking the ruby quartz helmet containing Cyclops' power. Cyclops quickly takes down Pierce and frees the other X-Men before blasting Leland out of the room and shooting the floor out from under Shaw. Colossus engages Pierce as Cyclops orders Storm and Nightcrawler after Shaw while Wolverine takes on Leland. Mastermind, seeing the day as lost, uses his power to hide in the background. Meanwhile, at Avengers Mansion, Beast receives an alert that the X-Men are attacking the Hellfire Club. Rather than call in the other Avengers and risk fighting his old teammates, Beast erases the alert and heads out to help the X-Men. 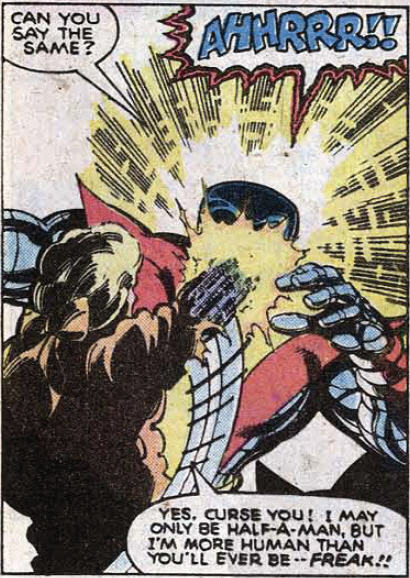 Back at the Hellfire Club, Colossus manages to destroy Pierce's cybernetic arm, but the villain manages to escape. Nightcrawler distracts Shaw while Storm creates a micro-blizzard around Shaw, freezing the fight out of him. Shaw breaks off the confrontation and rendezvous with Pierce, conceding the battle as lost but affirming that the war goes on. Upstairs, Cyclops is trying to herd guests out of the mansion, but Mastermind's illusions make everyone see him as an attacker. Just then, the rising storm water strikes the power conduit Wolverine exposed earlier in the evening, and the power goes out. As Cyclops orders a full retreat under the cover of darkness, Jean confronts Mastermind, explaining that the shock of seeing Cyclops die snapped her out of his control. Terrified of the darkness growing inside her which he unleashed, Jean puts Mastermind's mind in touch with the universe, and unable to cope with the sensation, he goes mad. She rejoins the other X-Men and the group leaves the club. Though she damps down her rapport with Cyclops, he can sense something is wrong with her and is determined to get her to Professor X as quickly as possible. 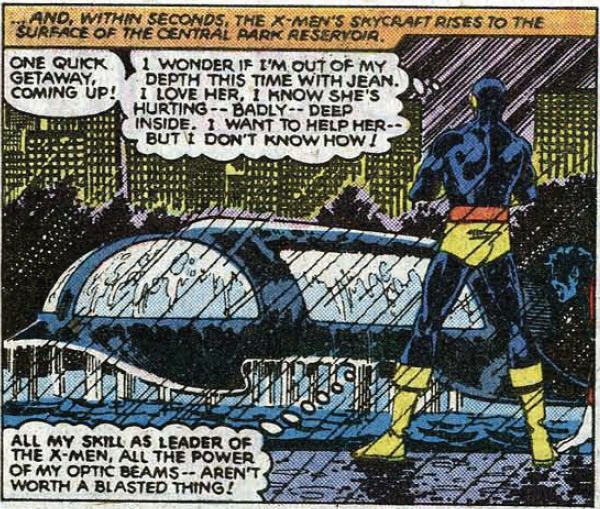 The X-Men board their skyship. 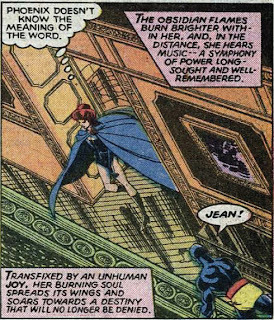 Jean senses Cyclops intentions, but knows it's too late for her. 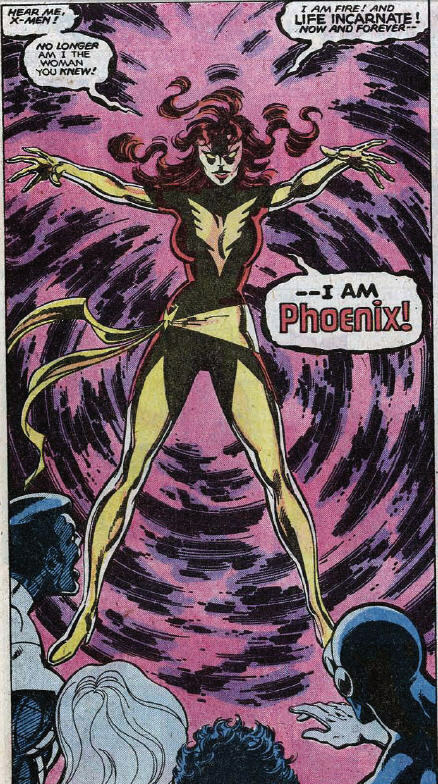 As the ship climbs into the air, Jean proclaims to the X-Men that she is no longer the woman they knew, once more anointing herself as Phoenix, and destroys the aircraft. 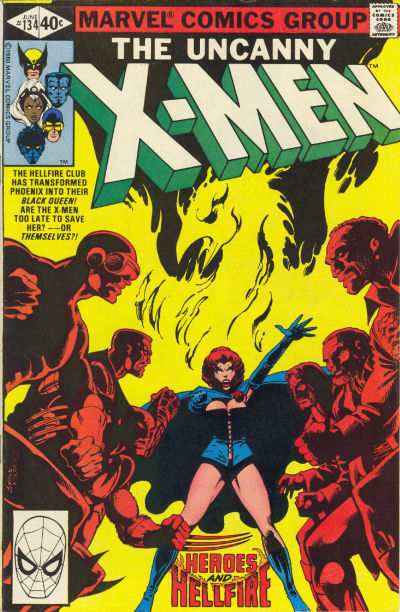 This issue marks the first appearance of Dark Phoenix, as Jean is overcome by the darkness within her, released through Mastermind's machinations. Her words echo those of her initial transformation into Phoenix, when she emerged from Jamaica Bay in issue #101. It is said that Avengers Mansion is four blocks up Fifth Avenue from the Hellfire Club mansion. It is revealed that Mastermind was able to telepathically place his illusions in Jean's mind through the use of mind tap device created by White Queen. 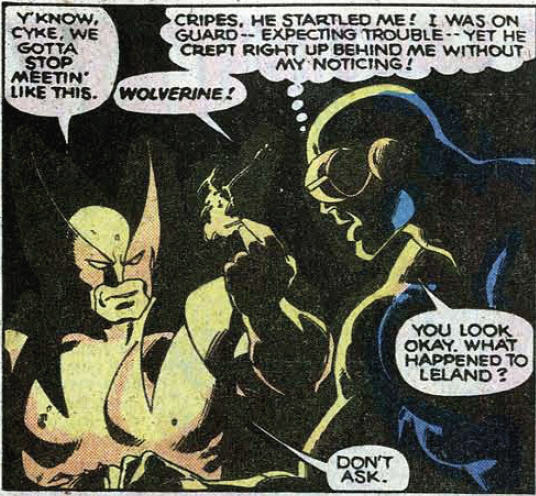 Wolverine manages to sneak up to an on-guard Cyclops in the dark, to Cyclops' amazement. It's also implied that he may have killed Leland (though we'll eventually learn Leland survived). 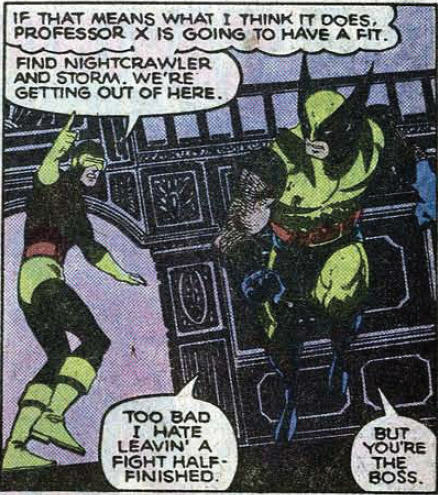 In a testament to the Wolverine's new-found respect for Cyclops, when he's ordered to retreat, Wolverine agrees without arguing, even though he'd rather stay and fight. 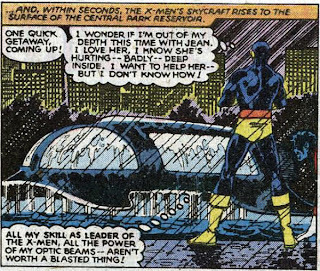 The X-Men took their skyship (the one stolen from Larry Trask's Sentinel base back in issue #60) from New Mexico to New York, and submerged it in the Central Park reservoir while they infiltrated the Hellfire Club. And continuing a running bit from earlier in Claremont's run (in which the X-Men's various vehicles tend to explode out from under them), the skyship is destroyed by Dark Phoenix in the last panel of the issue. “The obsidian flames burn brighter within her, and, in the distance, she hears music – a symphony of power long-sought and well-remembered." 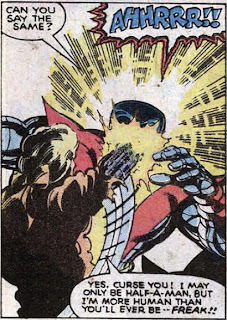 It is a metaphor that reportedly irritated Byrne, though it's unclear if he objected to its use in this issue, or just in later instances (Claremont will re-use this particular metaphor again). Here, at least, I rather like it, and think it works. As Jason Powell points out, Claremont's purple prose in these captions is at odds with the action being depicted. In most cases, the narration accompanies relatively mundane scenes: Cyclops running down a hall, the skyship taking off. The juxtaposition of baroque words against routine action helps build suspense within the issue, creating the sensation that something large and grand and probably terrible is about to burst forth. This issue features another instance of "defeat snatched from the jaws of victory", as the X-Men escape the Hellfire Club and free Jean from their control only to come face-to-face with an even more powerful and evil incarnation of their teammate. It's another penchant of Claremont's that bugged Byrne (the inability of the X-Men to never have a "clean" win). This issue has an excellent cover (and kicks off a string of classic, iconic covers) which is also an homage to the cover of issue #100. There's a neat bit to open the issue which shows the X-Men as they are, as they should be, and how they appear to the entranced Jean. Byrne and Austin turn in a fantastic sequence of panels depicting Mastermind as Jean gives him the power he craved, making him one with the universe and, his mind unable to cope with the sensation, driving him mad. This is another great issue for Cyclops the tactician, as he goes from dead to orchestrating a successful counterattack within a few pages. Shaw even recognizes the talent of his foe. 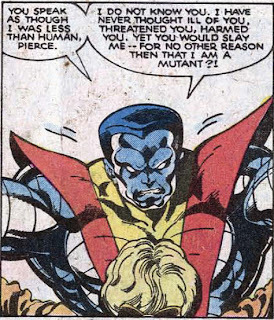 There's a great exchange between Colossus and Pierce as the two fight, which makes clear Pierce's anti-mutant prejudices (despite his working with mutants) and features a nice little speech from Colossus. The notion of the X-Men as outlaws, distrusted by the general public (as opposed to the Avengers or the Fantastic Four) isn't something with which Claremont has dealt much so far in his run, but he starts to return to that notion in this issue, as Shaw declares his intentions to make the world see the X-Men as criminals. Though little comes directly from Shaw's threat, it's clear that the events of this issue have painted the X-Men in a negative public light, as they are seen as simply attacking a well-respected institution, for which the police and the Avengers are called out. The second act of the "Dark Phoenix Saga" comes to a close, and this is the issue upon which the entire saga pivots. Though the X-Men have defeated the Hellfire Club and escaped, the victory is Pyrrhic, as the events of the last several issues have left them in an even worse position. Even for readers who don't know what's coming next, Claremont and Byrne do a masterful job of building suspense throughout the issue. From the moment Jean snaps out of Mastermind's control, she clearly knows something terrible has happened. Narrative captions throughout the issue let us into her thoughts: she is terrified of what is happening to her, and the fact that she can't stop it; she is filled with joy at the thought of exacting retribution on Mastermind, yet is saddened to feel that joy; she knows that Cyclops is trying to help her, yet at the same time, knows he is too late to do anything. It all builds to a terrific cliffhanger in which Jean, overcome by her dark side unleashed by Mastermind, echoes the words of her earlier transformation and becomes Dark Phoenix. The X-Men have overcome the Hellfire Club, but the truth is right there in the title: too late, the heroes. I've always liked that about this era too. 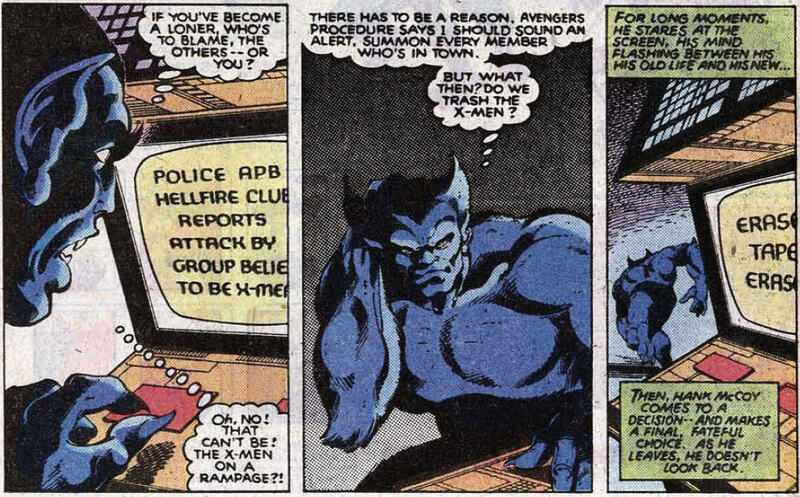 And, not only was Beast shown leaving Avengers Mansion this issue, if memory servers he doesn't appear in the Avengers book while he's hanging out with the X-Men over the next few issues of X-Men. Another favorite! I think the middle three issues of "Dark Phoenix" are the best chapters, and this one wraps the Hellfire Club segment with a bang. "It's also implied that he may have killed Leland (though we'll eventually learn Leland survived)." I never thought about it before, but I wonder if Leland's return (at the same time as Cole, Macon, and Reese) was also dictated by Jim Shooter? I always read that line as implying his death, too. And when I read "Dark Phoenix" for the first time, he actually was dead, so I just assumed this was how it had happened. 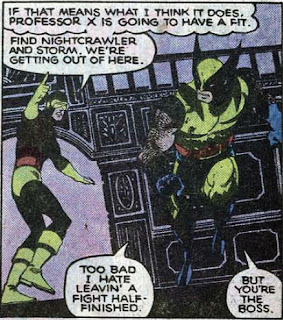 "...when he's ordered to retreat, Wolverine agrees without arguing..."
I love that touch. Does Cyclops comment on it in the next panel? I feel like he does, though I can't recall. I kind of think it would've been better if he didn't, and the interaction could've just spoken for itself. 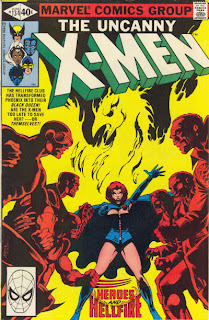 "It's another penchant of Claremont's that bugged Byrne..."
Though Byrne was obviously complicit in it this time, having drawn the appearance of Dark Phoenix here. He seems to complain most when he drew the X-Men winning or working as a team or what have you, and Claremont scripted the opposite. Also, Byrne claims that for the final year or so, he was doing the lion's share of the plotting, and Claremont was basically just the scripter. I really find that hard to believe, but on the off chance that it's true, he could've come up with this particular "defeat from the jaws of victory" himself. "Shaw even recognizes the talent of his foe." Alas, I don't believe Cyclops and Shaw ever had the chance to go head-to-head again, did they? I know Cyclops is in the Hellfire Club's next appearance, but I don't really recall him doing anything of note. But I could be misremembering. "The notion of the X-Men as outlaws, distrusted by the general public ... isn't something with which Claremont has dealt much so far in his run..."
"...it's clear that the events of this issue have painted the X-Men in a negative public light..."
Not long from now, the X-Men will be introduced in practically every issue as "that outlaw band of mutant heroes". I wonder if this was the catalyst for that. Prior to this issue, I don't recall the X-Men ever engaging in overly wanton property damage without a villain around (such as Eric the Red at the airport in issue #97), or at least without Professor X present to pull the ol' mass mind wipe routine. But thanks to Mastermind, the public honestly believes the X-Men attacked a respected establishment for no apparent reason. As far as I can recall, they were never cleared of that. This could be why they became "outlaws" in the first place. @Matt: I wonder if Leland's return (at the same time as Cole, Macon, and Reese) was also dictated by Jim Shooter? That would certainly make sense, though I don't recall, does Leland pop up in the next Hellfire story (in issue #151/152? He must...)? when I read "Dark Phoenix" for the first time, he actually was dead, so I just assumed this was how it had happened. Ditto. Though once I did read his actual death, I rather liked it (despite the horrid costume he was wearing at the time). Does Cyclops comment on it in the next panel? He does not. The next panel cuts to Jean's attack on Mastermind, so it remains a pleasantly subtle moment (I overlooked it the first few times I read this issue). I know he plotted the Alpha Flight crossover, and I think -- though I could be mistaken -- that most parties agree "Days of Future Past" was mostly him as well. Not sure about "Demon", though since Kitty was "his" character, it seems reasonable he could've masterminded her first solo story. Yeah, I think "last 6 months" is more accurate. I know the Alpha Flight story is pretty much 100% Byrne, and the crediting of that story one of the final catalysts of his departure. I'm fairly certain the idea for "Days of Future Past" came from Byrne, though I think Claremont was more involved (beyond the infamous "lesbian kiss" that so enraged Byrne), and obviously picked up on threads from it later in his run. The demon story I'm not as sure about, but you make a good case for it being a Byrne idea. On the other hand, he was heading out the door at that point, so he might have just tossed it out there and let Claremont run with it. Alas, I don't believe Cyclops and Shaw ever had the chance to go head-to-head again, did they? Not that I can recall. I don't remember them interacting much in #151/152, and by the time Shaw faced the X-Men again, Cyclops was cordoned off in X-Factor, and then Shaw was killed off for awhile. I think they bumped into each other during Joe Kelly's run on adjectiveless X-Men in the 90s, and I know there was a recent story involving Emma, Shaw and Namor that I haven't read yet, but by then we're pretty far removed from Shaw's comments in this issue. As far as I can recall, they were never cleared of that. This could be why they became "outlaws" in the first place. That definitely seems likely. It was another subtle thing I never picked up until re-reading the issue for this post, but I can't think of any definitive event that would have labeled them as outlaws prior to this. There were certainly a handful of "mutant menace" stories (like the original Sentinels story and the Thomas/Adams one) that certainly painted the X-Men in a negative light to the public, and plenty of "normal people don't trust them like they do other superheroes" comments prior to this, but like you said, nothing that can really be pointed to as causing a declaration of the X-Men as outlaws, in a legal sense. Heck, even Lang's Sentinel attack in issues #98-100 was explicitly done without government sanction. But after this (and especially after "Days of Future Past") is when all the "government is out to get the X-Men" stuff starts in earnest, and becomes the significant element of their story we know it to be. "It is a metaphor that reportedly irritated Byrne, though it's unclear if he objected to its use in this issue, or just in later instances (Claremont will re-use this particular metaphor again)." Byrne seems to complain alot. And now I have to ask, what was his issue with the lesbian kiss? It's a good thing Wolverine set up his exposed wire trap only two issues earlier so it can all remain in the same trade paperback. Although, I really hope they did not refer to the fact that Wolverine exposed those wires in an earlier issue, or else I might feel alientated. @Dr. Bitz: Byrne seems to complain alot. Yeah, he does. I'm tempted to call him a complainer, but that's not quite fair. He has strong opinions, and he's not afraid to voice them. I'm fairly certain Claremont has his fair share of gripes about Byrne, but he tends to keep those to himself while Byrne has no issues sharing them with the world. To his credit, he at least recognizes that he doesn't play well with others (or at least has strong opinions about things that might bother others) as X-Men is more or less his last major project with a writer collaborator. Pretty much everything of note he does after leaving X-Men he does with himself as both writer and artist. And now I have to ask, what was his issue with the lesbian kiss? I forget the exact details, but at the end of "Days of Future Past" Future Kitty and Past Kitty's mental selves pass one another, and the elder gives her younger self a kiss on the cheek, or something like that, and present Kitty remembers it. Apparently, it really torqued off Byrne because he didn't want the two characters to interact or for young Kitty to have any memory of the experience. Like I said, I forget the details offhand (I'll look them up at some point) but it pretty much boils down to Byrne feeling like the story was his, and then Claremont coming along and scripting something Byrne neither intended nor drew happening, and Byrne was at his breaking point when it came to Claremont doing that. Although, I really hope they did not refer to the fact that Wolverine exposed those wires in an earlier issue, or else I might feel alientated. "...does Leland pop up in the next Hellfire story?" I'm pretty sure he's there, and he may even make some comment about Wolverine, though I'm not sure. It would've been a nice touch to have him walking with a cane or something subtle to imply that Wolverine had done him some lasting damage. "(despite the horrid costume he was wearing at the time)"
All the Hellfire "costumes" in that story were pretty awful! I absolutely love John Romita Jr. as an artist, but with the exception of the Hobgoblin (which was basically just a derivative of a Ditko costume), costume design was not one of his strong points in the 80's. I did like Leland's end, though. Hmm, not sure why I thought he did. Maybe I was crossing my wires with Cyclops's thoughts in another issue or something. Anyway, in that case I'm glad it was kept subtle! I know that I caught it at some point, but not on my first few readings of this story. it was probably sometime after I'd finally read the Proteus issues. @Matt: ...costume design was not one of his strong points in the 80's. JRjr is my all time favorite comic book artist, but you're absolutely right: costume design, at least back in the 80s, was certainly not one of his strong suits. Those Hellfire costumes were awful (though I think the colorist did them no favors as well), his Colossus design wasn't terrible but wasn't very good, either, and there's also the awful Magneto "big M" costume. Teebore -- JR jr. put Colossus through a couple of costumes, as I recall, before finally returning him to his original look! I think the lesson learned is to never mess with a Dave Cockrum design, because they're usually pretty well perfect from the get-go. Regarding the giant "M" Magneto costume, I've always wondered if that was a Bill Sienkiewicz design, since he was the artist on New Mutants at the time, where Magneto had more exposure. In fact, I think he even drew it first. Plus, something about the sleeveless magenta weirdness of that look just says "Bill S." to me. I liked Magneto's later costume, with the classy flared collar and loose tunic. I've always thought he should've kept some variation on his helmet, though. He never looked quite right without it, plus -- why would you ditch your protection from mental attacks just to make a fashion statement? @Anne, Matt: SPOILER ALERT: Harry Leland used his mutant power so effing hard that he gave himself a heart attack while fighting Nimrod, the future Sentinel. Exactly! And even better, he was using his power to pull Shaw, who had been punched into orbit by Nimrod, back down to Earth, such that Shaw hit Nimrod with the mass of a small meteor. I'd forgot what a cliffhanger this issue ended on. Yowza! Does Sebastian Shaw always have to fight shirtless? Captions: "But Jason Wyngarde is merely a facade. He is actually... Mastermind -- the mutant master of illusion!" What the frak is up with that floor? Is it a weirdly patterned rug or pink marble or...? And who decided to match it with dark-green curtains? I love the idea that Leland instinctively uses his power, causing Wolverine to come down at him with even greater force. That's so believably human a mistake. I've always loved the Byrne/Austin take on The Beast, too — just the right amount of shadow and fur-to-muscle ratio in the depiction. Byrne's 1979 stint penciling Avengers is one of my favorite eras of the book. VW: compi — A gratis helping of 3.14159 servings of sake. Teebore: In a testament to the Wolverine's new-found respect for Cyclops, when he's ordered to retreat, Wolverine agrees without arguing, even though he'd rather stay and fight. I noticed this and hoped/expected you'd comment on it. Teebore: There's a neat bit to open the issue which shows the X-Men as they are, as they should be, and how they appear to the entranced Jean. Yeah, I really enjoyed that — no surprise, given my earlier comments about the mimicked-panel transition in front of the Pryde house at the end of #131. We got another O.J. appearance in this issue as well — the ad for Dingo boots on the inside back cover ("The Dingo Kids Meet O.J. Simpson"). I'm not sure if I ever noticed this before, but based on the boys' faces it looks like it might have been at least penciled by Win Mortimer, a longtime comic-book artist whose work is most familiar to me from Spidey Super Stories and the Supergirl feature in Superman Family. I can't find any corroborating opinions in a quick Google search, though. VW: dectus — A catcus as big as ten normal cacti. Matt: Not long from now, the X-Men will be introduced in practically every issue as "that outlaw band of mutant heroes". "Chris and I insisted that it was "feared and hated by the world they are sworn to protect" that defined the X-Men, but Shooter would have none of it." Dr. Bitz: I really hope they did not refer to the fact that Wolverine exposed those wires in an earlier issue, or else I might feel alientated. How wrong you are, my friend! While it's not explained the moment the blackout occurs on Pg. 17, that's only because back on Pg. 3 the scenario was set up with a four-panel, one-caption sequence and accompanying ultra-precise editor's note. "It's been raining hard since before dawn, and the water level in the sewers has been rising steadily all day -- towards a thick sheaf of power cables whose insulation was slashed open by Wolverine when he and his fellow X-Men infiltrated the club. *"
"*See X-Men #132, Page 10, Panels 6 & 7 -- Sneaky Salicrup." I'd say "don't remind me" but... too late. VW: unatier — A single shelf. @Blam: Does Sebastian Shaw always have to fight shirtless? Apparently he's Marvel's answer to the O'Neil/Adams "Hairy Chested Love God" Batman. That's so believably human a mistake. Yeah, that is a great little moment. I probably should have highlighted it. Byrne and Austin also do a great job of depicting it. Byrne's 1979 stint penciling Avengers is one of my favorite eras of the book. Ditto. And the Count Nefaria story he did with Shooter is one of my favorite comic book stories, period. Somehow, I totally missed that. 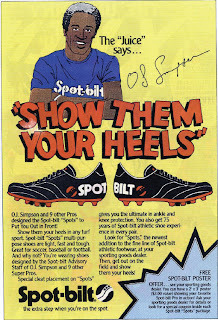 OJ was all over these books back in the day! a longtime comic-book artist whose work is most familiar to me from Spidey Super Stories and the Supergirl feature in Superman Family. Those Spidey Super Stories are ka-razy! Tons of goofy fun. I've seen that quote (or variations on it) in a few places, but what's really interesting about it (that I didn't realize until our discussion of this issue) is that this is really the first time Claremont and Byrne showed that in the comic, rather than just having it told in the logline. Maybe that was a result of Shooter's interference, but more likely, they just hadn't really gotten around to it yet. The "world tour" arc was a-typical for its time, and they quickly transitioned from that to "Proteus" and then "Dark Phoenix" with just a brief break for a more "traditional" super-hero story. So they might have believed that "feared and hated" was the important part of the byline since the beginning, but this was when they first started to show it (with "Days of Future Past" cementing it as the significant element of the X-Men mythos). Which, really, is neither here nor there. It's just cool to realize there's yet another foundation stone for the future of the book being laid during the "Dark Phoenix Saga" that I had totally missed until now. that's only because back on Pg. 3 the scenario was set up with a four-panel, one-caption sequence and accompanying ultra-precise editor's note. Ah, drat! I didn't go back far enough when I double-checked. You're right about the building tension, especially for those of us who know what's about to happen. It's the kind of grim-yet-helpless foreshadowing I wanted from the Star Wars prequels, but that Lucas and Christensen failed to deliver in Revenge of the Sith. I love Leland's swan song too. Even Wolverine had to give grudging credit. It's always bothered me that 'slave storm' isn't attractive. It was even noticeable to me in my early teens when the comics first came out. 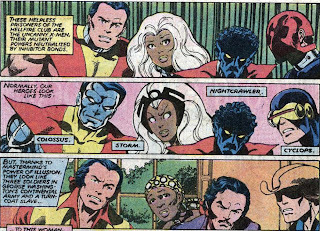 But look at the panel in your post where we see the captured X-Men as they usually look/look now/look to Jean. Colossus looks the same, with slightly longer hair. Nightcrawler looks like he'd probably look sans blue fur. Cyclops looks like he took off his visor & put on a hat. It's hard not to see this as Byrne thinking, "Actual Africans back then were ugly. Big nose. Big lips. Storm is mixed & beautiful. Or 'mutant & beautiful'." Mutant & beautiful would be worse, implying only a mutant woman could be black & still beautiful. Anyway, I've never gotten a racist vibe off of anything else he's done. So maybe I'm reading more into it than there is. 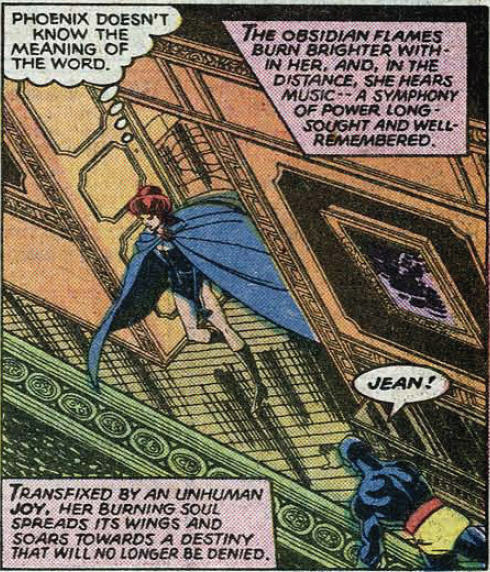 PS: It's even more noticeable in the previous issue when Jean teases Ororo with the translation of her name. In response to @Mr. Kerchak ... I believe it isn't that "slave Storm" (for lack of a better name) is "ugly" ... I believe it's always been that Storm's facial appearance is part of her mutation ... in addition to the white hair and blue irises, she's got feline/elvan facial structure and nose (remember Cockrum originally wanted her to be a werecat and incorporated that into her design). So I think what Byrne is implying here isn't necessarily racial but rather "Mastermind has Jean not see the four X-Men as mutants" ... note Kurt is also not blue and his face is slightly different as well. I'm pretty sure there's an actual issue or interview that explicitly states Ororo's feature's are part of her mutation but I cannot recall. In response to a bunch of comments here, too many to quote, indeed this is the beginning of the "X-Men are outlaws/criminals" phase, which essentially ends (ironically enough) with Fall of the Mutants, when the X-Men sacrifice themselves on live TV while at the same time X-Factor is declared saviors of New York. By the time the public discovers the X-Men are discovered by the world-at-large to be alive (X-Tinction Agenda) they are basically considered to be heroes again ... largely due to Dallas and the public hero phase of the original X-Factor (plus the fact that the O5 X-Factor is essentially the X-Men).